IUJ will proudly honor our top academically performing students in the Graduate School of International Management with the “James Brian Quinn Scholar” Award starting with the Class of 2019. This unique honor will be earned only by the top 5% of the graduating class* based on cumulative GPA for the duration of their IUJ degree program. 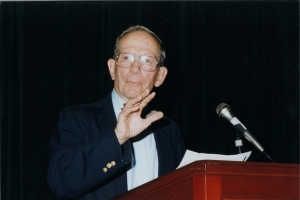 This Award’s namesake, Dr. J. Brian Quinn (1928 – 2012), became the first Dean of IUJ’s business school, Graduate School of International Management, in 1988 when it opened its doors with the help of the Amos Tuck School of Business, Dartmouth College’s graduate business school in the United States. 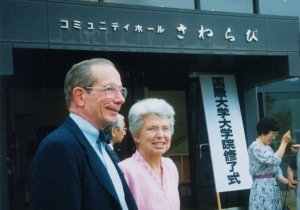 He served in this capacity for the first 4 years of the program, collaborating closely with IUJ Board Chairmen Sohei Nakayama, Jiro Ushio, and Yotaro Kobayashi. He was a highly celebrated business school academic, business and government advisor, speaker and author in the fields of strategic planning, management of technological change, and entrepreneurial innovation, and developed one of the first courses on entrepreneurship in a U.S. business school. Dr. Quinn’s international experience extends far beyond Japan. He had extensive international assignments in Geneva and Melbourne. He was an advisor to many governments and U.S. Presidential administrations. In 1979, he was called upon by the U.S. Department of Commerce to participate in a mission to launch the opening of U.S. trade with the People’s Republic of China. 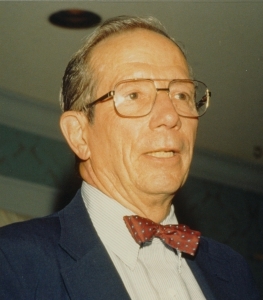 As a National Academy of Science representative for the U.S., he visited the Soviet Union in 1989 to advise on strategies for creating a market economy to the newly formed Gorbachev government. In the United States, while based at the Tuck School, he served on National Academy of Science teams on Science and Technology for International Development, and on Strategy and Technology in Colombia, Peru, Nepal, and the People’s Republic of China. He chaired the Academic Committee for President Clinton’s Domestic Policy Review on Innovation and Productivity, coordinated by the Department of Commerce. Dr. Quinn published extensively on both corporate and U.S. national policy issues, and received numerous prestigious awards for his teaching, influential articles in Harvard Business Review and other top management journals, and for a number of his books. He earned degrees from Yale (BS), Harvard (MBA) and Columbia (PhD) before joining the faculty at Tuck in 1957. He retired from his professorship there in 1993 after completing his deanship at IUJ. IUJ is honored to receive permissions from the Quinn family in October 2018 to honor IUJ’s top graduates with the James Brian Quinn Award. *Recipients must also be in good standing considering character.